With spring the garden beckons, but before pulling on your boots, consider some tips for pain free gardening. Certainly, gardening itself has the benefits of easing stress and providing a form of exercise. Once completed a spring clean in the garden can provide a sense of accomplishment. However, remaining injury free will make for a positive experience and keep you actively developing your green thumb. Luging bags of fertiliser and mulch, pulling out old plants and weeds, turning soil for planting vegetables, pruning bushes or trees and digging holes to plant your recent purchases to the garden can take its toll. Add to this a reduced amount of mobility over winter, followed by this sudden flurry of gardening activity, and true chances of an unwanted sprain or strain are greatly increased. So what to do about preserving yourself and taking care of the jungle outside your window? Just like a professional athlete returning to competition after a winter hiatus, there needs to be a gradual return to activity. Like the pre season training and practice of athletes, it is best to ease into the spring gardening season as there is always plenty to do. Luging bags of fertiliser and mulch, pulling out old plants and weeds, turning soil for planting vegetables, pruning bushes or trees and digging holes to plant your recent purchases to the garden can take its toll. With names like gardeners’ back, weeder’s wrist and pruner’s neck, the most common injuries are lower back pain and strains to ligaments and joints. Surprisingly most of these can be avoided with a little preparation. The following exercises can be performed daily over winter, in the lead up to the spring gardening season. Working on your garden in stages will spread out the physical work and take the pressure off having to complete everything at once. 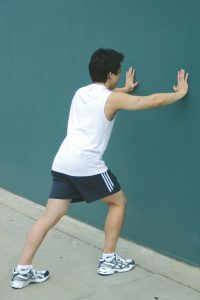 Not being in a rush will make it easier to use correct lifting and squatting techniques especially as muscles used for shorter periods more frequently will avoid fatigue and with it the chances of injury. Go for a walk for at least 10 minutes to get the blood flowing and then try some dynamic warm up exercises such as squats, knee raises or lunges. Make sure the exercises you do match the type of activity you plan to do in the garden. Running through the movements you plan to use in the garden before using them practically, makes sense. For example, squatting before you lift anything will not only warm up the area but can be a quick reminder of the best technique and test to see if there are any twinges before putting the body under load. 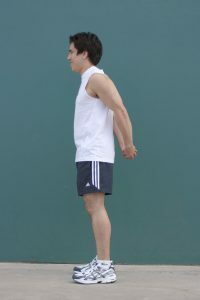 These exercises can be performed after your brisk walk and just before heading out into garden. Generally gardening will involve some amounts of squatting, lifting, reaching, pushing and pulling. 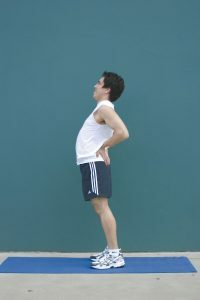 Keeping you back straight whilst doing these movements is important, and you can also follow these pickup and lifting techniques to avoid back injury. Accessories like knee pads or a kneeling bench will keep you pain free and more focused on perfecting your posture. Whether you use these or not be sure to get up every five minutes to avoid cramping and alternate between tasks to use alternate muscle groups. Making sure your tools tare sharp and in good order will contribute the ease with which you garden. Also having the right tools can help avoid injuries, for example a pruner on an extension pole will save you over reaching or the hassle of negotiating a ladder. Getting hold of a powered gardening tool can save you time and reserve your energy for the more enjoyable parts of gardening. It is well worth the money to avoid a repetitive use injury and potential rehabilitation, by hiring equipment for bigger jobs. A powered post hole digger for planting or an electric hedge trimmer are just a couple of examples. Moving regularly will help you set up in the right position and hopefully avoid unnecessary twisting from side to side or over reaching. For example when lifting an object or digging with an implement keep your hands close to your body as the more you reach the harder muscles need to work. Importantly, when you do need to be in one position for more than a few minutes, it is important to stop regularly and stretch the muscles. These exercises give some examples you may like to use. By bringing things on the ground up to waist height and things above to below your shoulder height you will resolve most of your ergonomic issues. Potting can be done more easily on an old sturdy table and raised garden beds or herb boxes make planting and picking a breeze. Using a small scaffold for fruit picking or tree and hedge trimming, provides a stable and comfortable platform from which to work and can be hired from most large hardware stores. Overall you should limit yourself to 30 to 45 minutes of work when you first start back in the garden. This can be built up over time as your body is conditioned. If you do find yourself sore when planning to go back for another gardening session, you can still keep things moving. Spend this recovery time planning your garden by shopping or looking online for what to plant or fixtures such as water features or outdoor furniture for the relaxing afternoons that lie ahead. For the most part the health benefits of being outdoors and being active make gardening attractive. Taking the advice above where relevant and being practical when it comes to other health related issues such as taking care of accidental cuts, avoiding sun exposure, being careful around chemicals, wearing appropriate clothing and using the correct safety gear, will make your pain free gardening experience all the more enjoyable. If you do injure yourself then seek physiotherapy advice and remember that all is not lost. Local kids can finish off what you started with some pocket money or you could coax a neighbour with the promise of fresh flowers and vegetables – with the assumption that nature is happy enough with your work to produce the desired results.